She’s the ultimate woman – renowned Primatologist, conservationist and UN messenger of peace. We talk to Dr Goodall about chimpanzees, climate change and her hope for the planet’s future. Getting hold of Dr Jane Goodall is no easy task. At 83 years old, the animal activist is running life at a pace that most youngsters wouldn't be able to contend with. Goodall travels almost 300 days of the year sharing all that she's learnt during her decades of studying primates and spreading a message of inspirational hope for our planet's future – and there's no stopping her. "I give lectures talking with young people, corporates, government decision makers and farmers in rural African villages," says Goodall. "When I discovered how fast the natural resources of our planet are being used up and the damage we are inflicting, I knew I had to try to do something about it." With her signature long hair tied back in a ponytail, determined Goodall exudes a calm confidence as she gives her talks around the world. Her latest venture, a tour here in Australia, "to discuss hope for the natural world in troubled times." If you missed it, you can catch up on her social media news. 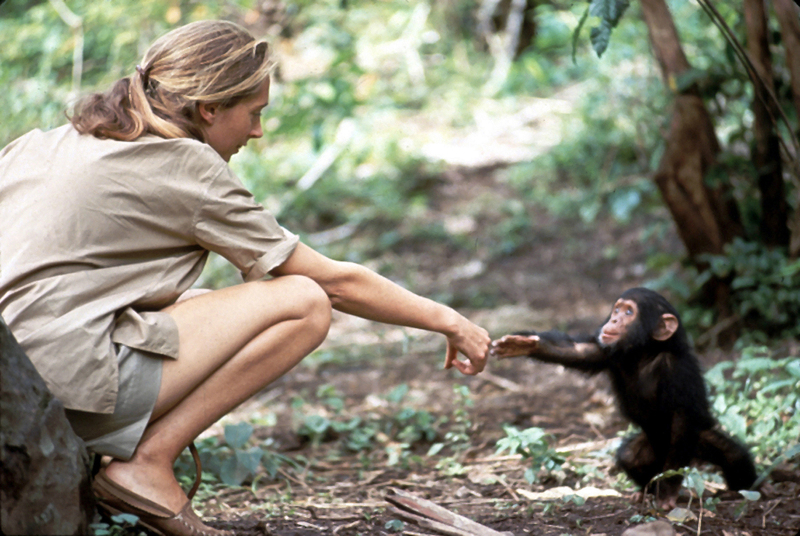 Goodall is best known for her studies of wild chimpanzees in Gombe, Africa. Despite having no formal training and working in a male dominated field, her observations and work has been credited with revolutionising the way we think about animals and humans today. "When I went to Africa [in 1960] I had no desire to be a scientist – just to live with animals in the wild and write books about them. After I had been in the field with the chimpanzees for almost two years, my mentor, Louis Leakey, got me a place in Cambridge University to get a degree in Ethology. I had never been to a college of any sort. I was nervous," Goodall recalls. "Many professors chastised me for giving the chimps names not numbers and for describing personalities, minds capable of thinking and above all, emotions," says Goodall. "But I had been taught that in this they were wrong – by my childhood teacher, my dog Rusty." Getting her PhD without changing her beliefs, Dr Goodall continues to be an inspiration to women, men and youngsters around the world. "I have never cared what people thought of me, provided I have spent enough time questioning what I am doing so that I can be assured that I am doing the right thing, to the best of my ability," she says. "My son and three grandchildren, Merlin, Angel and Nick, all try to lead sustainable lives, simply by following my example." Does she still visit Gombe? Yes. "I visit Gombe for a few days twice a year to talk with staff, to (hopefully) see the chimps and to spend one day in forest alone to replenish my spirit," she says. Fast-forward over 50-years, the establishment of the Jane Goodall Institute – which works to protect chimpanzees and their habitats – numerous books including her autobiography Reason for Hope and well-earned recognition and honours as Dame of the British Empire and UN Messenger of Peace, Dr Goodall is now putting her heart and soul into her youth program Roots and Shoots. "It began with 12 high school children in Tanzania," she says. Today, the program is now active in over 100 countries with thousands of young people inspired to make the world a better place. "The main message is every individual makes a difference every day. From kindergarten through to university, our members work on conservation projects that they choose themselves. They can feel good about what they're doing and see the difference they're making." 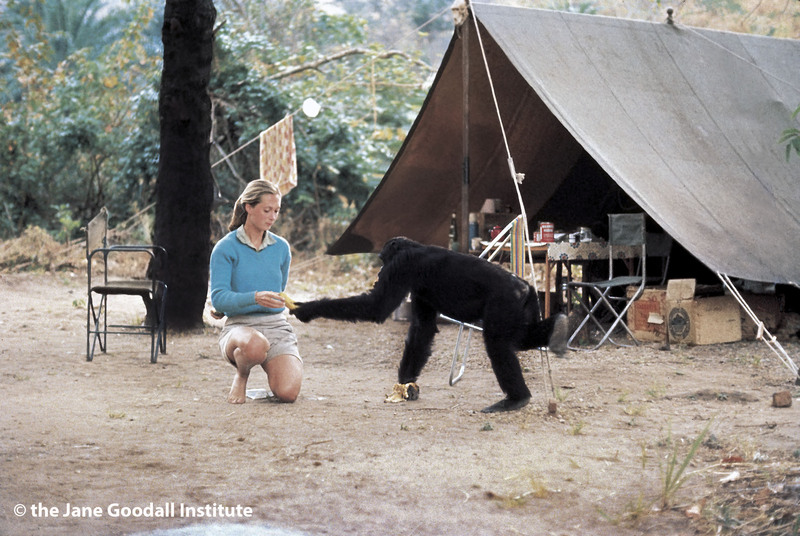 Over the years and the miles, Goodall has met many inspirational people who are making a difference in the world. "To pick one who has made a huge impact – Muhammad Yunus," she says. "He created the Grameen Bank that has lifted millions of people from poverty and given them a new life and hope for their children." Jane's own program Lake Tanganyika Catchment Reforestation and Education (TACARE) has also been greatly successful in improving the lives of people around chimpanzee habitat by addressing poverty and supporting sustainable livelihoods. Despite always seeming positive and upbeat, Goodall too sometimes feels close to despair. "My biggest fears are that corporations that harm the environment will win despite public opinion owing to corruption, particularly agribusiness, pharmaceutical giants, developers and the extractive industries such as logging, mining and fracking," she says. It worries her "when Donald Trump tries to turn back efforts to protect the environment or to corrupt politicians in Latin America and Asia." "But I am very obstinate. I will fight for what is right and I get my hope from the amazing people I meet doing amazing projects to protect the environment and to fight discrimination, corruption, poaching, illegal and legal timber and mining companies," she says. "Seeing the results of peoples' efforts to protect the wilderness and save animal species from the brink of extinction, and bring hope to a poor African village or inner city area," is what keeps her going. "I am inspired by the indomitable human spirit." Will Goodall ever retire? No siree. "So long as my brain functions I shall write and talk about these things. I'm passionate about the harm we are inflicting on the natural world and must spread awareness. I'm desperate to turn things around and will not stop travelling to give my message – that there is hope. We have only a small window of time. We must each do our part." 1. I don't eat meat or fish. My favourite exotic vegetarian dish I've eaten on my travels are bright yellow, small, mushrooms picked in the Goualougo rainforest in Republic of Congo. They were cooked by pygmies with special forest leaves and eaten around a campfire at night. 2. I only buy stuff I absolutely need. Many of my clothes I have worn for years. Knowing how we are harming the planet with a greedy and unsustainable life-style, I try to leave as light an ecological footprint as I can. 3. I turn off all lights and TV when I'm not using them. I almost never use air-conditioning in hotels refuse room service, put clean towels and pillows aside with "clean" written on a note and use backs of things for lecture notes. I save rolls of slices of bread from a lunch or a dinner to eat for breakfast. 4. I think I have always lived sustainably. I was only a child during World War II but our food and clothes were rationed. I think since then I have never taken things for granted. 5. I try to convince people that if we all make ethical choices each day in what we buy, eat and wear we shall move towards a more sustainable world. Jessica Houtby is an editor and freelance writer (namely environment, travel, wellness and issues that matter). When she's not watching Attenborough documentaries she's planning her next wild adventure. You can follow her on Instagram.